Just above the keyboard are the drawbars. 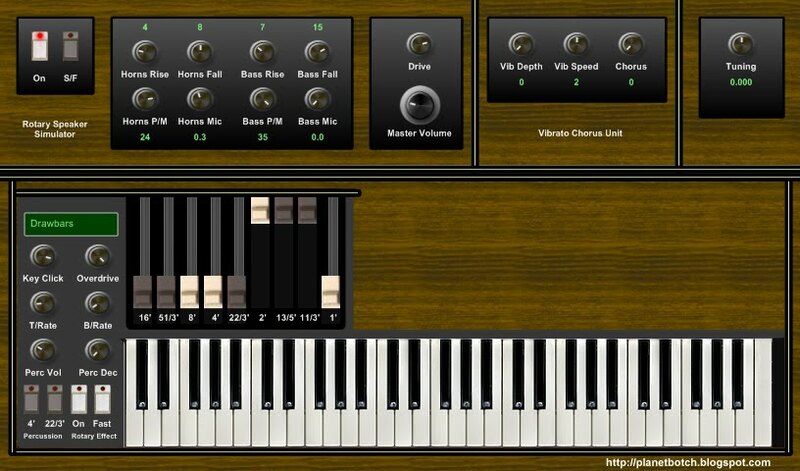 These replicate the sounds of the drawbars on an analogue tonewheel simulator. Each introduces a specifically-pitched sine wave. Combining sine waves of various pitches produces more complex tones. Draw down a given drawbar with the mouse to increase its volume. Mix the drawbar sounds as you choose, to create the tones you like. To the left of the keyboard and drawbars is the organ’s main control panel. At the top of this panel is a green Presets display. Click on the display to select a preset from the drop-down list. The presets will reset the drawbars and controls accordingly, revealing how each sound was created. Immediately below the Presets display are adjustments for Key Click volume and Overdrive. The Overdrive is mild, just adding a slight rough edge. Next down you’ll find T/Rate and B/Rate knobs, adjusting the rate at which the analogue-style rotary speaker effect speeds and slows. T/Rate applies to the treble element, and B/Rate applies to the bass. Below that there are knobs for Perc Vol and Perc Dec. These amend the volume and decay length of the percussive attack, when Percussion is selected for use. On the bottom row of the organ’s control panel are the switches for two different ‘footages’ of percussive attack (left), and the on/off and slow/fast switches for the analogue-syle rotary effect. Above the main organ section is the instrument’s amp simulation and outboard effect section. The Real Rotor provides a more authentic incarnation of a rotary speaker effect for those who find the analogue-style version too tacky. The On switch activates the effect, and as you’d expect, the S/F toggles between chorale (slow) and tremolo (fast) rotation. To the right of the switches you’ll find controls for the rotary effect’s main parameters. Here you can set the rise and fall rates for the horns (treble element) and the bass, along with the mic distance (from the speaker) and variations to the pitch modulation (PM). Changing the values of these parameters should allow you to get your ideal rotary speaker sound – or close to it. Finally, there’s a Drive and Master Volume control for the amp simulator. To the right of the Real Rotor comes the Vibrato Chorus Unit. The Vibrato Depth and Speed controls are self-explanatory. The Chorus can either be set off (0), producing pure vibrato, or on (1), producing the classic mix of vibrato and original signal. On the far right, beside the Vibrato/Chorus, there’s a knob for tuning. In most instances this would be set to zero, but you may, for example, want to use acoustic instruments (or samples) which are not tuned to concert pitch, and need to adjust the tuning of the VSTX3 to match. It's not that prominently featured, but as a point of interest, the original version of the VSTX3 was used on the 2009 track She's Back. If you're interested in a very quick crash course on setting Hammond type drawbars for your own sounds, please see Setting Hammond Drawbars - The Easy Way. Please see the instructions on the Virtual Organs landing page for terms and installation.